Looking at the chemical composition of stars that host planets, astronomers have found that while dwarf stars often show iron enrichment on their surface, giant stars do not. The astronomers think that the planetary debris falling onto the outer layer of the star produces a detectable effect in a dwarf star, but this pollution is diluted by the giant star and mixed into its interior. Just a few years after the discovery of the first exoplanet it became evident that planets are preferentially found around stars that are enriched in iron. Planet-hosting stars are on average almost twice as rich in metals than their counterparts with no planetary system. The immediate question is whether this richness in metals enhances planet formation, or whether it is caused by the presence of planets. The classic chicken and egg problem. In the first case, the stars would be metal-rich down to their centre. In the second case, debris from the planetary system would have polluted the star and only the external layers would be affected by this pollution. When observing stars and taking spectra, astronomers indeed only see the outer layers and can't make sure the whole star has the same composition. When planetary debris fall onto a star, the material will stay in the outer parts, polluting it and leaving traces in the spectra taken. A team of astronomers has decided to tackle this question by looking at a different kind of stars: red giants. These are stars that, as will the Sun in several billion years, have exhausted the hydrogen in their core. As a result, they have puffed up, becoming much larger and cooler. Looking at the distribution of metals in fourteen planet-hosting giants, the astronomers found that their distribution was rather different from normal planet-hosting stars. "We find that evolved stars are not enriched in metals, even when hosting planets," says Pasquini. "Thus, the anomalies found in planet-hosting stars seem to disappear when they get older and puff up!" Looking at the various options, the astronomers conclude that the most likely explanation lies in the difference in the structure between red giants and solar-like stars: the size of the convective zone, the region where all the gas is completely mixed. In the Sun, this convective zone comprises only 2% of the star's mass. 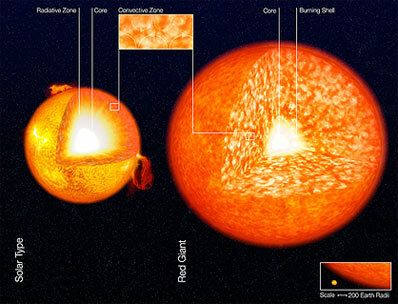 But in red giants, the convective zone is huge, encompassing 35 times more mass. The polluting material would thus be 35 times more diluted in a red giant than in a solar-like star. "Although the interpretation of the data is not straightforward, the simplest explanation is that solar-like stars appear metal-rich because of the pollution of their atmospheres," says co-author Artie Hatzes, Director of the Thuringer Landessternwarte Tautenburg (Germany) where some of the data were obtained. When the star was still surrounded by a proto-planetary disc, material enriched in more heavy elements would fall onto the star, thereby polluting its surface. The metal excess produced by this pollution, while visible in the thin atmospheres of solar-like stars, is completely diluted in the extended, massive atmospheres of the giants.